The Tri for a Cure is a major event, and participants need lots of information to have the best experience with training, preparation, and completing the race. We have put together our Athlete Guide that answers (almost) any questions you may have. Please take the time to read it thoroughly – it will provide invaluable information to have the best possible Tri for a Cure experience. The Tri for a Cure has many first-time triathletes. To help you prepare, we have put together a comprehensive program combining information, hands-on experience, and on-the-course training that will give you the knowledge you need to prepare your mind and body for this incredible experience. Please make an effort to attend every clinic you register for. Please email [email protected] if you won't be able to attend. Clinic tickets are non-refundable. Are you wondering, “Oh my gosh – what did I get myself into?” Well, no need to be asking that question. We are here to put your mind at ease. What do I wear, what equipment do I need, what training is needed, what is race day like? Answers to these and any other questions you may have will be answered. We will have some first-time participants tell you what it was like for them on race day too. You will leave feeling good about the journey you are about to be on! Riding the Tri for a Cure Course is always great training. The better you know the course for race day, the better prepared you are. sheJAMs along with Portland Velo Group Members will be there to lead the way! We will also practice (T2) Transition for those of you doing the event as an individual so bring your running shoes. The Tri For the Cure run clinics are focused on previewing the run course. Come on out to SMCC and run the course. This will be a fun run. Come learn from the experts on how to change your bike tire. Bring your own bike tire, along with the tools you have to change it with. Bring a bike tube, tire levers, CO2 cartridge. If you don’t have those items, you can buy them at CycleMania before the clinic. There will be three on-course swim clinics held at SMCC. Open water swim expert, and Tri for a Cure Swim Coordinator, Kirsten Read from sheJAMs & KGR Coaching, will discuss water safety, navigation and provide important swimming tips before sending waves of women into the water for a swim around the course. Trainers, race director, and volunteers will be available following the swim to answer any questions and concerns. These clinics are offered to provide women with the chance to experience an ocean swim with a group, as it will be on race day. This will be a good opportunity to practice with your wetsuit and get comfortable with the cool water temperature. We will have sheJAMs “SWIM ANGELS” available for those who need them. All participants are encouraged to swim in open water with your wetsuit several times before race day. The clinics are a way to experience swimming with a group of 100 women in a swim wave. Race day should not be your first time in open water. Please be prepared, because swimming in cold open water on race day take practice. We will also practice (T1) transition – so bring your running shoes. Race Director Julie Marchese will present a transition clinic in a classroom setting for Tri for a Cure Individuals and Relay Teams. Participants will learn about transition flow, how to set up a transition station, safety and rules of transition. Ample time will be provided for questions. Clinic will be held for both Individuals & Relays! FIRST TIME INDIVIDUALS AND RELAY TEAM MEMBERS – THIS CLINIC IS A MUST! 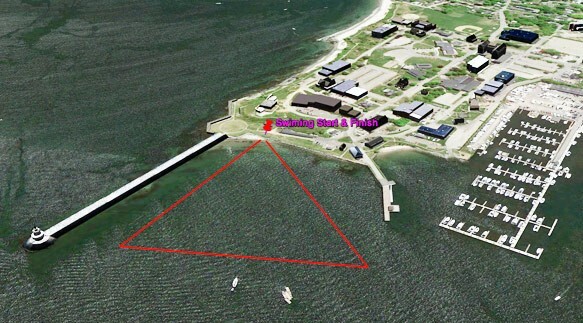 The swim is a 1/3-mile counter-clockwise triangular course that starts and ends on the beach at the beginning of the Spring Point Lighthouse area on the SMCC campus. The cove is fairly well protected from winds and swells. Swimmers are reminded to keep the marking buoys to their left. A Coast Guard boat will be in the water, along with several kayak and surfboard lifeguards. Volunteers and medical staff will be stationed on the beach and along the jetty monitoring every moment of the swim. Any athlete in need of assistance during the swim should turn over on their back and wave their hands and someone will come to them. Athletes are permitted to stop and rest on a boat/kayak without any penalty, as long as no forward progress is made. Note: Any athlete new to ocean swimming or swimming in a wetsuit is STRONGLY ENCOURAGED to practice several times before the race. Several swim clinics are available. For those prone to hypothermia, please inform medical personnel (in red medical t-shirts) located at the swim start before the race. Each swim wave is indicated by a specific swim cap color. Caps will be distributed at packet pickup. Swim waves will begin promptly at 8:30am, with survivors leading the way. Waves will go off approximately every 3 minutes. Wave assignments and specific wave order will be posted at registration. Survivors will go first, followed by Survivor Relay, age groups, relays & novice. Athletes MUST go with their designated swim wave, otherwise, disqualification will result. After exiting the water onto the beach, run up two steps to Mini-Transition. Athletes will cross over timing mats that will record the end of the swim and the beginning of the first transition time. Remember, the first transition time will include mini transition and your run up to the transition area. The swimmer can use the wetsuit strippers to help remove the wetsuit. Upon reaching the wetsuit strippers, athlete should have wetsuit pulled down to waist. The athlete will lie down on her back on the grass and let the wetsuit stripper do the rest. Athlete will be handed her wetsuit and should then proceed to mini transition. Swimmers may also remove their own wetsuit. Please be considerate and make space for other swimmers exiting the water. After wetsuit removal, each swimmer locates their running shoes previously placed on the numbered racks, puts on her shoes and proceeds to the bike-transition area. Note: Athletes MUST leave swim-transition carrying wetsuit/swim gear. Tri for a Cure is not responsible for wetsuits left in the swim-transition area. During the 1/4 mile run to the bike-transition area you must wear close-toed shoes - BEST would be to wear sneakers! No flip flops, Crocs or bare feet allowed. The 15-mile bike route is a lollipop-shaped course on flat and rolling urban roads. The course will be well marked with signs and monitored closely by numerous volunteers wearing orange flags and vests. Please use caution and keep your speed under control, especially when approaching an intersection or turn. Helmets MUST be fastened before getting on your bike! Mounting a bike without YOUR helmet fastened may result in disqualification. Helmets may not be unfastened until after passing the dismount line. Passing is only allowed on the left. Roads are open to automotive traffic and all normal traffic rules are enforced, including stopping traffic lights & stop signs. Be aware! Police may stop cyclists along the course to moderate traffic. The most likely stopping point on course is the Entrance to Portland Headlight. iPods or other music players and headphones are not allowed. Disqualification will result. We recommend racking your bike in the lowest (easiest) gear. Fort Road goes uphill immediately after leaving the transition area. Turning LEFT onto Rt. 77 from Sawyer Rd. in Scarborough. A police officer will be stationed at the intersection to help with traffic. Turning RIGHT back into the transition area on your return ride. This is a very sharp curve! CycleMania will have an official mechanic support station in the transition area and a support vehicle riding along the bike course. Athletes experiencing mechanical difficulties may notify the nearest volunteer so that the mechanic can be alerted. There is no guarantee that the mechanic will be able to fix your bike on the course. Three motorcycles will be on the bike course. Riders will be wearing Volunteer t-shirts. They will be looking for distressed cyclists and will come to cyclists’ aid if need be. There are no water stations on the bike course. Plan ahead and bring a water bottle! Bikes must be re-racked in their original spot before an athlete can proceed to the run! Athletes will NOT be allowed back into Transition until the last person has transitioned to the RUN. No exceptions will be made! Keep in mind the waiting time that may result after returning from the run. We suggest keeping a set of clean dry clothes in your car, or with a spectator. Size Adjustments: Make sure your bike is adjusted to fit your height. Nearly all bikes have adjustable seats and handlebars. Shorts: Consider wearing bike shorts or triathlon shorts. They have built-in padding for comfort. Tri shorts typically contain less padding, but they do not absorb water, so you may prefer them if you are doing all 3 legs of the Tri for a Cure. Shoes: Bike shoes are recommended. They have stiff soles which give support heel to toe and also can adapt to clipless pedals. Helmet: Be sure your helmet fits and is within 5 years old. Polystyrene helmets can “dry up” and become brittle with age. Hydration: Equip your bike with a water bottle rack. It is recommended to drink 1 bottle per hour. Emergency Flat Kit: Compact bike repair kits can be found at most bike shops and fit easily under the seat. Traffic: Practice defensive biking! Always assume oncoming traffic hasn't or can't see you. Make sure your Bike is safe! Don’t just drag it out of the shed the day before and expect it to work. Local area bike shops can provide bike tune-ups. The proper pressure rating can be found on the side of tire. Check your air each time you ride. Low air pressure is the most common flat tire. Clean your bike after use. Sand and grit from the road will accelerate corrosion and wear. Keep the chain lubed up. Your bike will pedal faster with less effort! Cyclemania, located at 75 Cove St in the Bayside area of Portland, Maine. They rent bikes on a first-come-first serve basis and Cancer Survivors can rent a bike for FREE! Note: iPods and other personal music devices are not allowed on the course. You will be disqualified! The 3-mile run is a primarily flat loop course utilizing both roads and paved pathways. The course will be clearly marked with signs and monitored closely by volunteers. Quickly bear right to Adams – when you reach the parking lot take a left up Adams. Turn right on Preble Ext. 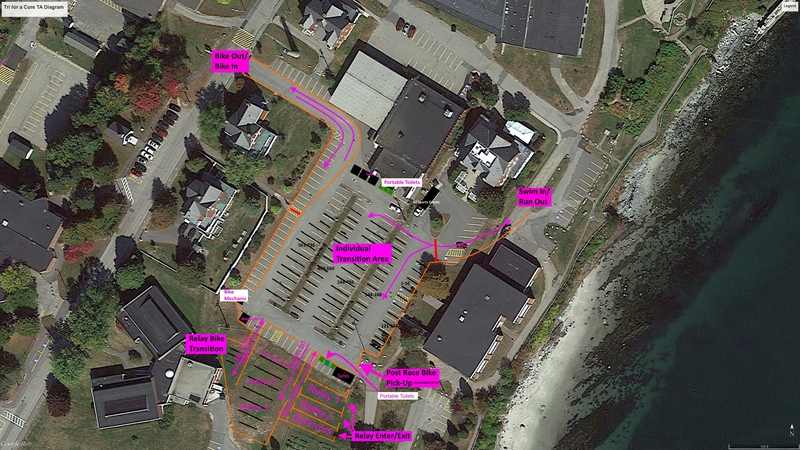 Water will be available at a station near Transition on Bunker Road and near Mile 1 and Mile 2 on the run course. There is only one traffic intersection crossing Broadway & Benjamin Pickett. Although this intersection will be monitored by Police, please use caution when crossing. The race number must be displayed on the front at all times during the run portion of the race. This is primarily for safety, but also makes it easier for the Announcer and photographers to recognize athletes crossing the Finish Line. Athletes planning to wear layers should keep in mind that the race number needs to be visible at all times. Do not pin the number to a layer that may be removed. If the race number is left along the course or in Transition, the athlete will need to go back and get it BEFORE finishing the race. Note: A race belt makes it easy to clip the race number on and off easily. There will be race belts sold at the Expo. There are a number of running clinics and warm-up races available between now and the Tri for a Cure. The 2019 Athlete Guide will be available in the spring. Please refer to the 2018 Athlete Guide for preliminary planning.